In the summer of 2012, a group of students at Eugene Lang College The New School for Liberal Arts were preparing to spend some time studying and working abroad. They were travelling to Cambodia to collaborate with a local non-profit, the Ponheary Ly Foundation, on issues of childhood education, poverty, and healthcare. To prepare, they spent five months in New York studying the history and politics of the region and studied the local language, Khmer, while on the ground in Siem Reap. “In one of our last sessions,” explains Lang senior Shelley Green, “we asked our instructor to give us some Khmer phrases and proverbs. One of them we all wrote down in our notebooks as ‘drop by drop you will feel the water.’“ Later, when they double-checked things with their teacher, it turned out he had actually said “Drop by drop, you will fill the bottle.” The entire class had heard him wrong, Green says, laughing. Oddly enough, they had already invested this new, hybrid phrase with a wealth of meaning. They were embarrassed, but also intrigued. It was a simple misunderstanding, but it led the students to think about the exchange between cultures, and how even the smallest gesture can be interpreted in ways that are impossible to predict. 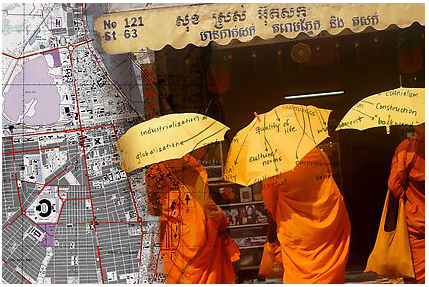 When it came time to put a title on exhibit of multimedia work that tries to grapple with the relationship between Cambodia and America, generated by those students and another group from Parsons, the phrase seemed a perfect fit. “As faculty, we have learned a tremendous amount about what it means to develop this kind of cross-divisional program with students who have different disciplinary training, vocabularies, and frameworks for making meaning of the world,” says Radhika Subramaniam, Director and Chief Curator of the Sheila C Johnson Design Center. Subramaniam, along with Jaskiran Dhillon, Lang Assistant Professor of Education Studies and Faculty Director of Lang in Cambodia, spent six weeks this spring leading an extra-curricular curatorial workshop for six students from Parsons and Lang. The students formulated an exhibition concept and design, selected work produced in prior courses by them and fellow students (including Lang in Cambodia 2012, History and Politics of Cambodia, Urban Design Senior Studio, Urban Interventions, Theory of Urban Form and Global Exchange) as well as material they gleaned during a field study trip to Cambodia over spring break. These disparate points of view and ways of working all add up, bit by bit to a compelling whole. Which brings us back to that title, and its implication of slow accumulation of meaning. “Seeing each piece in the gallery,” says Green, “makes the viewer think critically about all of the issues in Cambodia and how it relates to us here in New York in ways we might not expect.” Drop by drop, you will feel the water.